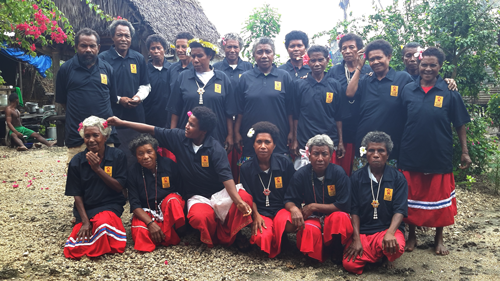 In rural PNG the mortality rate in childbirth is 1:7, with a maternal mortality rate of 3 in every 1,000 live births. The need for aid here is great. From the first 100 Birthing Kits that were distributed we saw a significant reduction in both maternal deaths and infant deaths. Originally supporting the villages of Kavataria, Mokosaida and Oyabia (2,000 people), Caring for Kiriwina has been able to expand Birthing Kit distribution to not only the villages of Kwemtula, Osaisuya, Gumilababa, Oyuveyova, Teiyava and Tukwaukwa (nearly 5,000 more people). 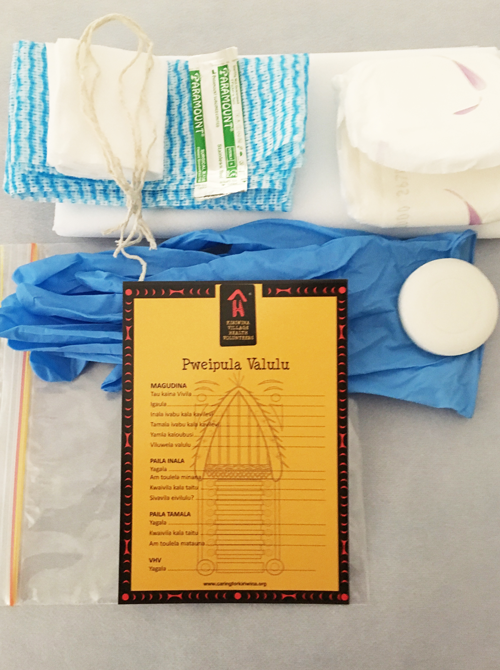 We now distribute birthing kits across the entire Island of Kiriwina of approx. 50,000 people, including outlying Islands. We also distribute to the VBA’s mobiles and top-ups, kerosene lanterns, torches, warm clothing and aspirators and much more. Each Birthing Kit also includes a Birth Certificate form, as birth records are not officially kept by the PNG Government. The Village Birth Attendants (VBAs), who make use of the Birthing Kits, require continued training in the use of the Kits and we are additionally fundraising to organise trainers from Australia to continue to provide free training for these volunteers. We have created a network of dedicated volunteers to help in the ongoing packing and distribution of the disposible Birthing Kits. Any donations will be used to purchase contents, freight to the Island, purchase of warm jackets for the midwives, purchase of kerosene for the lamps, keeping the mobile accounts for our constant communication with the Island in credit. HOW DO BIRTHING KITS WORK? Clean ties – to prevent bleeding from the umbilical cord for mother and baby. We have translated the instructions on the packaging into the Kiriwian language. We have also included a Birth Certificate form translated into Kiriwinan to allow official documentation of the birth. We have strict rules on disposal of the kits and direct communication via mobile phones with Kiriwian nationals on the island who supply a weekly report on proceedings. We supply over 180 midwives (Village Birth Attendants) from the following villages: Kavataria, Mulosaida, Kwemtula, Osesuia, Oyuvayova, Tukwaukwa, Wabutuma, Luya, Bwetalu, Loubuwa, Siviyagila, Kudukweikela, Kepwapu, Kuluwa, Buduweilaka. We have supplied 110 uniforms and need to supply another 70 midwife uniforms. In-Country managers: Toks Bwaina and Lepani Ahab and Mr Ariston Pesiana. Kylie and Diana Adams, Sue Thomas, Lone Sumbulla (our Brisbane representative), Dr Nadg Farag, Mary Jonmanssen, Jeff Keating, Monica Hitchinson, The Lawton Family (Ralph, Doug, Dave, Jenny and Jodi Lawton), Toks Bwaina, Dinah Siotama, The Yarralumla Uniting Church, P&O Cruises Joanna Dyson, Entertainment Director Pacific Aria and the Global Development Group.